The Mackinac Bridge, which carries Interstate 75 over the Straits of Mackinac between the Lower and Upper Peninsulas of Michigan, is a graceful suspension bridge. It was planned in the early 1950s and constructed over the course of three years. Construction beginning on May 7, 1954, and the bridge opened on November 1, 1957. The Mackinac Bridge has one of the longest suspension spans, with 3,800 feet between suspension towers; 8,614 feet between suspension bridge anchorages; and a total bridge length of 26,372 feet (approximately five miles). The bridge towers rise 552 feet above the surface of the lake, and the roadway is suspended 199 feet above the water. Photo taken 11/06/09. Interstate 75 provides the major link between the Southeast and the Great Lakes, serving the cities of Miami, Naples, Fort Myers, Tampa, Atlanta, Chattanooga, Knoxville, Lexington, Cincinnati, Toledo, and Detroit. A sentimental favorite of AARoads, annual road trips from the Midwest south to sunny Florida makes Interstate 75 a most enjoyable journey. A well-traveled route, Interstate 75 has enough traffic to justify six lanes in most locations. The majority of the route accommodates six lanes in Ohio, Kentucky, Tennessee, Georgia, and Florida. Several U.S. routes find their termini on Interstate 75, including U.S. 2 in St. Ignace, Michigan; U.S. 23 and U.S. 31 in Mackinaw City, Michigan; U.S. 10 in Bay City, Michigan; U.S. 24 near Pontiac, Michigan; U.S. 68 near Findlay, Ohio; and U.S. 74 near Cleveland, Tennessee (although some maps show U.S. 74 merged with Interstate 75 west to Interstate 24). U.S. 150 and 441 find their termini close to Interstate 75, on U.S. 25. U.S. 129 ends on a stretch of Interstate 40 in Knoxville that at one time was also designated as Interstate 75. U.S. 17, 19 and 301 in Florida also end close to Interstate 75 at U.S. 41. 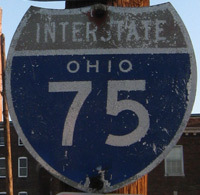 Interstate 75 in Ohio is part of High Priority Corridor 76: Interstate 75 Ohio. 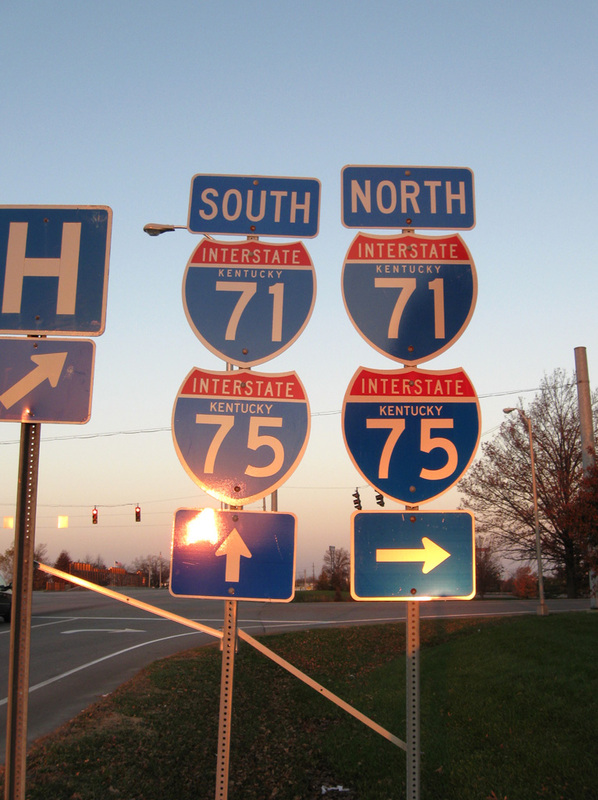 Interstate 75 parallels a variety of U.S. routes along its six-state journey. From Miami to Chattanooga, Interstate 75 closely parallels U.S. 41. From Chattanooga northeast to Knoxville, it follows U.S. 11 closely. From Knoxville north to Cincinnati, U.S. 25 remains in the shadow of Interstate 75. 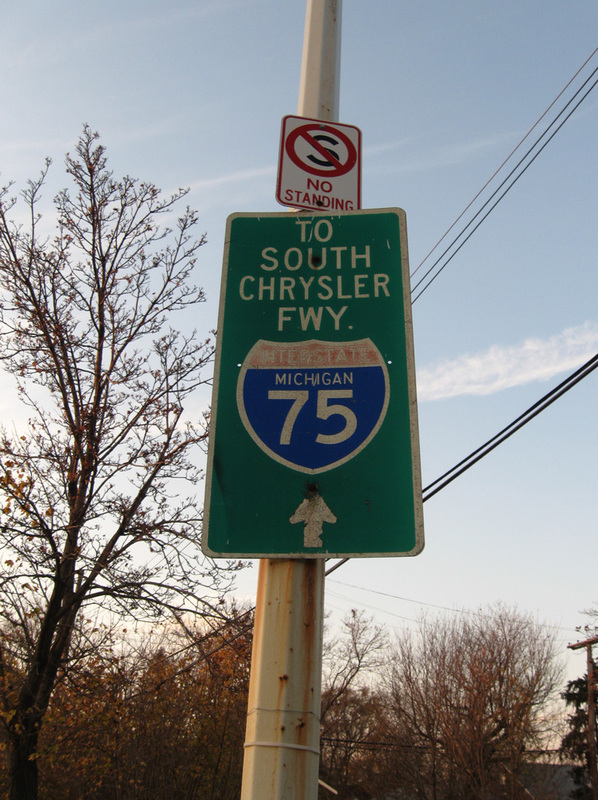 Interstate 75 replaced U.S. 25 between Cincinnati and Detroit, and it replaced U.S. 10 from Detroit to Bay City. 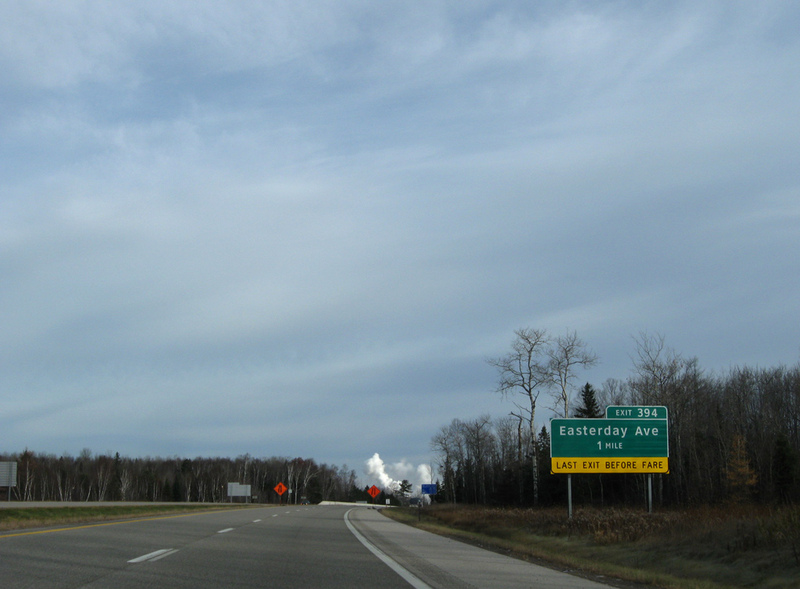 North of Bay City, Interstate 75 followed a new alignment before meeting and replacing U.S. 27 near Grayling, U.S. 23-31 across the Straits of Mackinac near Mackinaw City, and U.S. 2 from St. Ignace north to Ste. St. Marie. 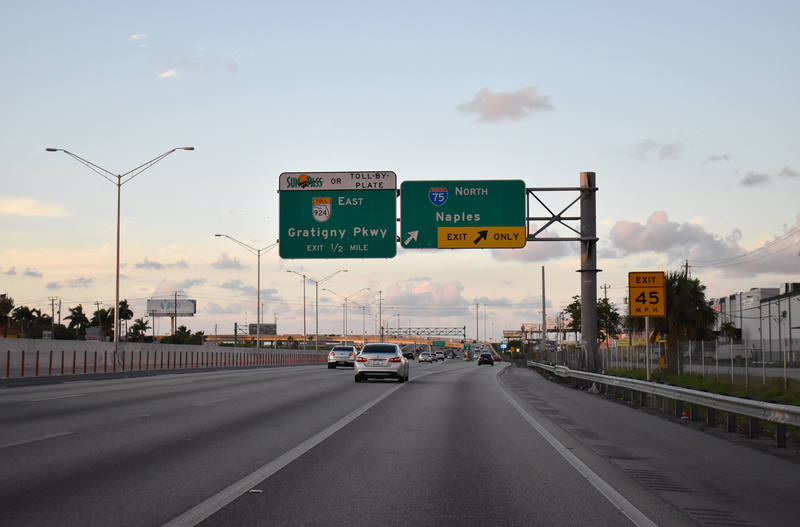 Interstate 75 begins its northerly journey at a relatively innocuous location, the interchange of Florida 826 (Palmetto Expressway) and Florida 924 (Gratigny Parkway) in Hialeah, just northwest of Miami. This was not the original planned southern terminus. When plans for extending Interstate 75 south of Tampa were first concocted, Interstate 75 was planned to begin at the current interchange between Interstate 95 and Interstate 395 in downtown Miami. Interstate 75 would have followed Florida 836 (Dolphin Expressway) west past Florida’s Turnpike (Homestead Extension) and followed U.S. 41 northwest to Naples, then north along its current alignment to Tampa. At the time this was considered, Interstate 395 was still to remain as is; one would have thought that Interstate 75 would have continued east of Interstate 95 along with U.S. 41 to the beaches with the planned alignment, but it was not so. FDOT maps confirm that the southern spur to Miami Beach was to be Interstate 395. However, with pressure to upgrade the tolled Alligator Alley (old Florida 84) to a superhighway, Interstate 75 was extended instead along that route. The route was changed sometime in the mid-1970s; it may have been as late as 1977 when Interstate 75 was relocated to the Alligator Alley (Florida 84). 6 This allowed the originally planned freeway corridor along the environmentally sensitive U.S. 41 corridor to remain a two-lane highway. 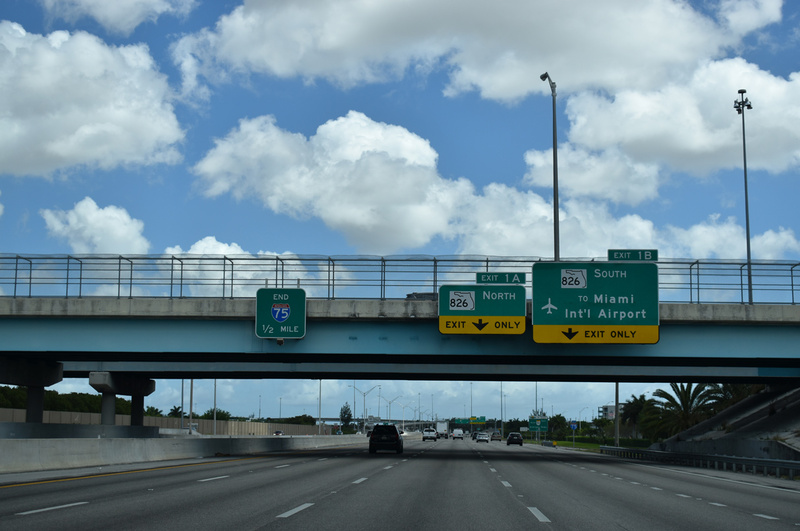 As a result of using the Alligator Alley, Interstate 75 was too far north to meet Interstate 95 in downtown Miami, so Interstate 75 was rerouted to meet Interstate 95 in North Miami, near I-95 Exit 9 (Florida 924). Due to local opposition, Interstate 75 did not make it all the way southeast to Interstate 95; it was truncated at Florida 826 (Palmetto Expressway). A portion of the freeway between Florida 826 and Interstate 95 was constructed; however, it was built as a toll road and not included in the Interstate highway system since it did not meet another Interstate at its end. A planned freeway, not yet acted upon, would parallel Florida 953 (LeJeune Road) south along a former railroad right-of-way to the east, ultimately connecting Florida 924 (Gratigny Parkway) with another freeway but not an Interstate. This freeway would extend south to meet Florida 112 (Airport Expressway) and Florida 836 (Dolphin Expressway). Currently, there are no plans to extend Interstate 75 southeast along the Florida 924 (Gratigny Parkway) and Florida 953 corridor. 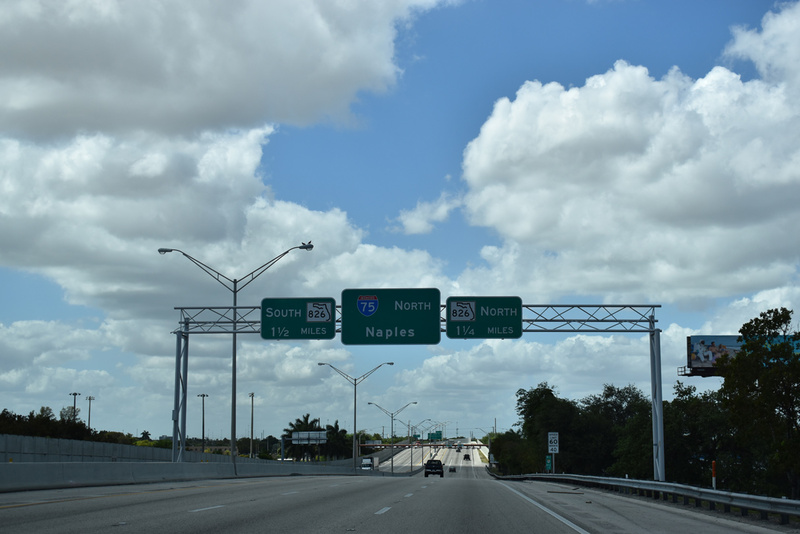 Leaving South Florida, Interstate 75 follows Alligator Alley, a toll facility linking the Miami metropolitan area with Naples and Fort Myers. Yes, there really are alligators hanging out in the canals and waterways along Interstate 75, especially through the Big Cypress National Preserve. This is the only toll road along the entire length of Interstate 75 (there is a toll bridge in Michigan). Although the Alley is east-west, the Interstate 75 is signed north-south. The project to widen the Alligator Alley from two to four lanes was completed in 1992, and tolls were slated to be removed at that time. 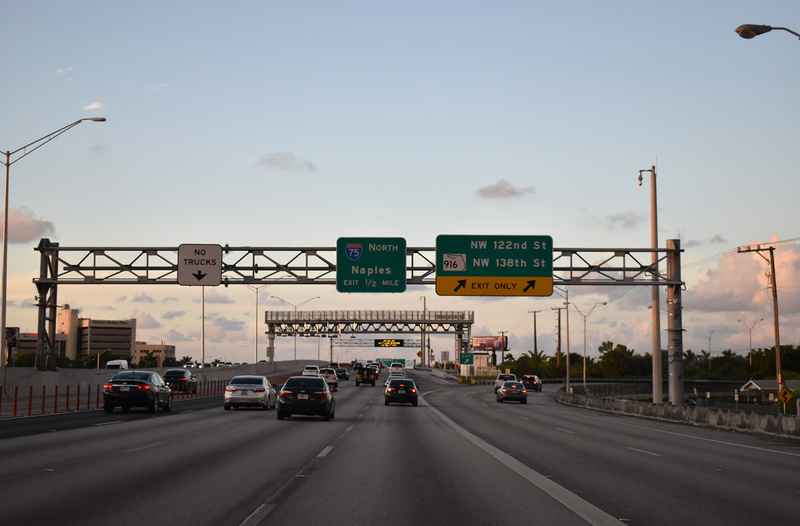 Ongoing mitigation for Everglades restoration, wildlife portals, fences, and other requirements have kept the tolls as a necessity for maintenance and monitoring that is not required on other sections of Interstate 75. Between Exit 48 (Big Cypress Indian Reservation) and Exit 80 (Florida 29), Interstate 75 passes through the Big Cypress National Preserve, a rare example of an Interstate highway passing through a national park. The six lane mainline of Interstate 75 runs between distributor roadways linking the freeway with SR 618 (LeRoy Selmon Expressway) and SR 60 (Brandon Boulevard) between Tampa and Brandon in Florida. This scene looks north from the SR 618 overpass. Photo taken 12/26/11. The last four-lane section of Interstate 75 through Tampa Bay was expanded by fall of 2015. 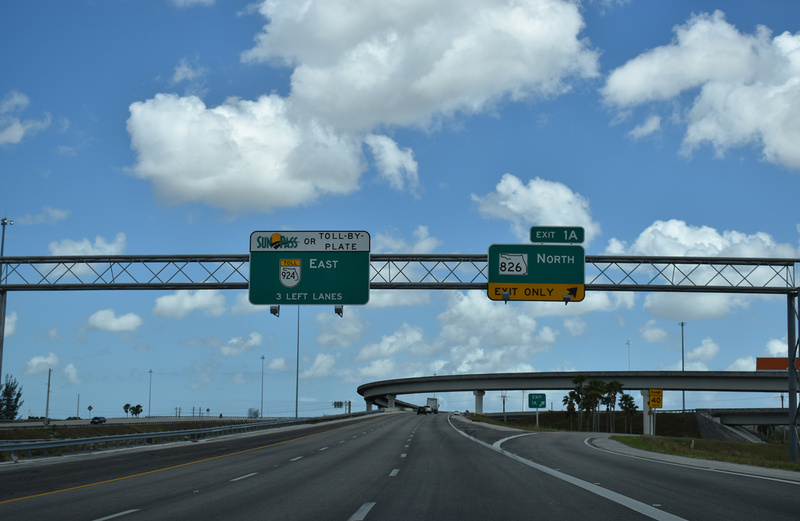 From Miami north to Tampa, Interstate 75 parallels U.S. 41. 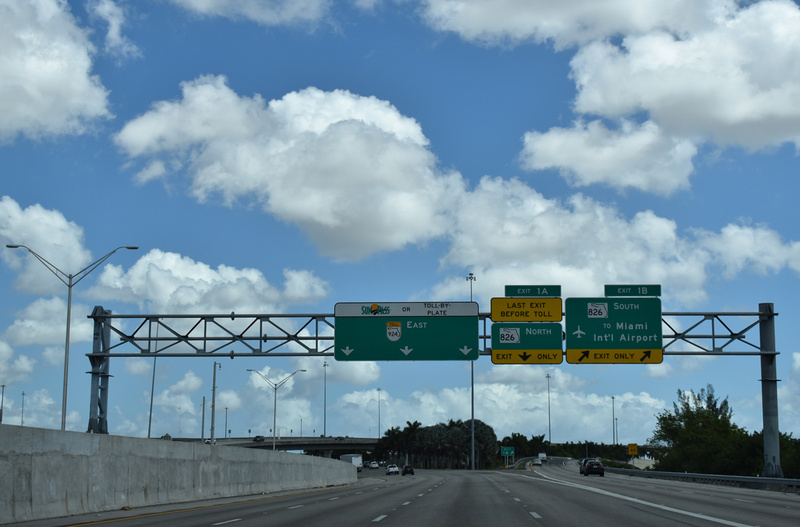 U.S. 41 is a toll-free alternative to Interstate 75 across the Everglades and through Big Cypress National Preserve, but with only two lanes and limited passing opportunities. Upon reaching the turnoff to Marco Island at its junction with Florida 951, U.S. 41 becomes very congested and slow as it ascends the Gulf Coast of Florida. Since completion of Interstate 75 through Southwest Florida in the mid-1980s, through traffic has diverted from U.S. 41 to Interstate 75. With the inland suddenly open for development as never before, Interstate 75 fostered the construction of housing, shopping, and entire communities within the shadow of the freeway. Previously empty interchanges grew to include traveler services, malls, and condominiums. Traffic has increased between Naples and Tampa due to the explosive growth of this region, and much of the route carries at least six lanes now. 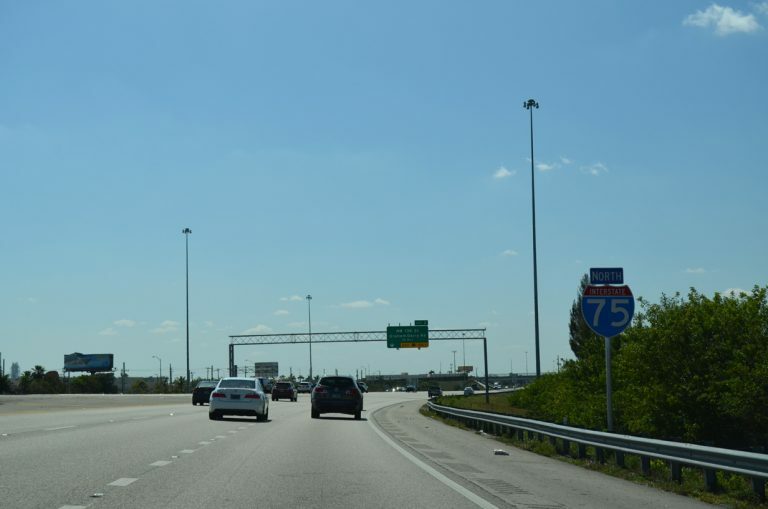 A previous widening plan under consideration for Interstate 75 in Collier and Lee Counties north of Florida 951 focused on financing expansion with toll (HOT) lanes. In 2005, state legislation approved the Southwest Florida Expressway Authority (now defunct) to oversee this future widening. And commonly known as the IROX project, the first 30 mile portion transformed Interstate 75 from four to six lanes between Collier County 846 (Immokalee Road) in North Naples to Florida 884 (Colonial Boulevard) in Ft. Myers. Until the completion of the freeway from Tampa to Naples in the mid-1980s south of the Tampa-St. Petersburg metropolitan area, Interstate 75 reached its southern terminus at the interchange of Interstate 4 and Interstate 275 in downtown Tampa. Prior to its extension south of Tampa, I-4 continued southwest on current I-275 south to St Petersburg, where it ended near downtown. So when it came time to extend Interstate 75, planners had a decision: should I-75 be routed through Tampa and St. Petersburg or keep it inland as a bypass of the metropolitan area? 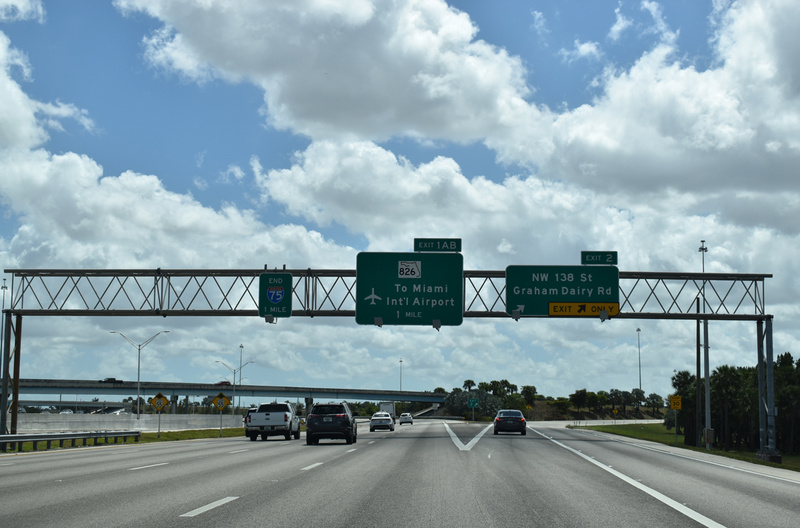 The initial decision was to route Interstate 75 along the current alignment of Interstate 275 through both Tampa and St. Petersburg, while an Interstate 75E was proposed to take the current alignment of I-75 east of town. By 1973, the current configuration for I-75 was selected, and the freeway was completed east of Tampa Bay in 1986. Even so, the unmarked Florida state road designations allude to the former route of I-75, with SR 93 accompanying I-275 through St. Petersburg and Tampa and SR 93A overlaying I-75 around the east side of Tampa Bay. Interstate 75 widens to eight lanes through the Brandon area east of Tampa due to commuter traffic. North of Tampa, Interstate 75 becomes the main gateway corridor from the Midwest states to Florida. Traffic is funneled to Interstate 75 via Interstate 74 and Interstate 64 from Indianapolis, Milwaukee, Chicago, St. Louis, and Minneapolis. The I-75 mainline carries travelers from Detroit and Ontario. 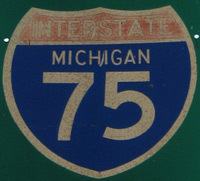 Many segments of I-75 are subject to delay as a result of the increased traffic related to the Christmas holidays and spring break. 1962 – Interstate 75 opened from Lake City to Genoa (first segment to open). Interstate 75 under construction from Ellisville to Lake City and from Genoa to the Florida-Georgia State Line. 1963 – Interstate 75 under construction from Wildwood north to Lake City. 1965 – Interstate 75 under construction from Interstate 4 in Tampa north to Chapman and from Wesley Chapel north to Wildwood. 1967 – Interstate 4 and Interstate 75 interchange in downtown Tampa (today’s Interstate 4 and Interstate 275 interchange) was constructed. This interchange is today commonly known as Malfunction Junction. 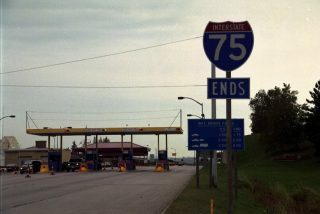 1967 – Interstate 75 opened from Wesley Chapel to Wildwood. 1968 – All of Interstate 75 north of Tampa was opened except for the short segment in Tampa between the Hillsborough River and Fowler Avenue. 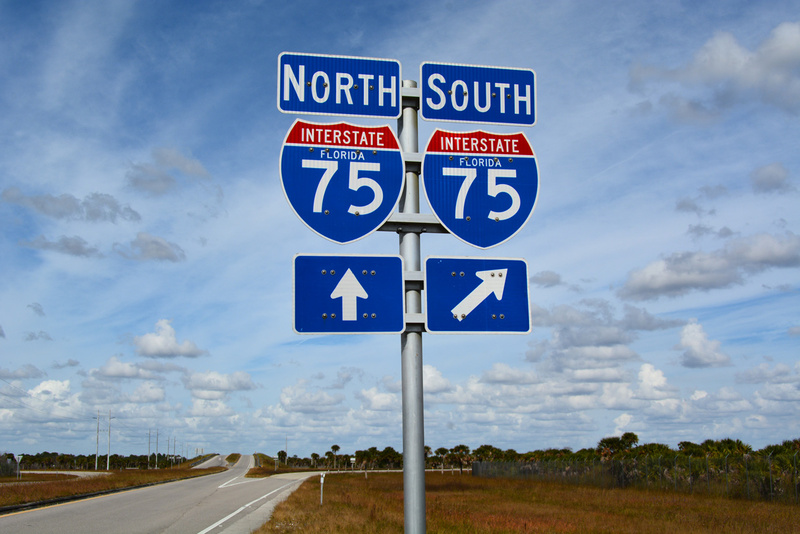 1969 – Interstate 75 was extended southwest along Interstate 4 into St. Petersburg. Interstate 75 had a new proposed routing up from Bonita Springs (north of Naples) to Rubonia. The Sunshine Skyway was also added to Interstate 75. 1971 – Initial proposal to extend Interstate 75 south from Naples to Miami considered along U.S. 41 (Tamiami Trail) corridor and Florida 836 (Dolphin East-West Expressway) in Miami. This proposed route was shifted to the Alligator Alley alignment in 1977. As a result of the truncation of Interstate 4, Interstate 75 was extended southwest through Tampa to St. Petersburg. 1972 – The southern terminus of Interstate 75 was at the junction with Florida 689 (54th Avenue North and Haines Road) in St. Petersburg. 1973 – Interstate 75 in St. Petersburg opened from 38th Avenue North to 54th Avenue North. Shortly thereafter, the Interstate 75 designation was shifted to the bypass route, while Interstate 275 replaced Interstate 75 on the city route. 1977 – Proposed route of Interstate 75 from Naples to Miami shifted to the two-lane Alligator Alley (Everglades Parkway). 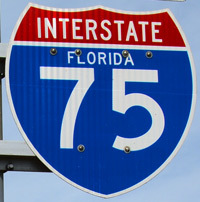 Signs for Interstate 75 were placed on the Alligator Alley. Another new proposed route for I-75 linked Golden Gate to Bonita Springs. 1978 – Interstate 75 under construction from Estero to Tropical Gulf Acres. 1979 – Interstate 75 opened from Estero to Bayshore and under construction from (1) near Opa-locka to near Andytown (U.S. 27), (2) Florida 951/Golden Gate north to Estero, and (3) from Tropical Gulf Acres to U.S. 301 near Ellenton. 1980 – Interstate 75 opened (1) from Bayshore to Harbour Heights and (2) North Port to Ellenton. Interstate 75 under construction from Ellenton to Florida 672. 1981 – Interstate 75 opened from County Route 846 north to U.S. 301. Interstate 75 is under construction from U.S. 301 north to Lutz (Interstate 275). 1982 – Interstate 75 opened from Ellenton to Florida 672. 1983 – Interstate 75 opened from Florida 672 to U.S. 301 near Temple Terrace. 1984 – Interstate 75 opened (1) from Florida 820 to County Route 818 and (2) from Bruce B. Downs Boulevard north to Interstate 275 near Lutz. 1985 – Interstate 75 opened from Florida 672 north to Bruce B. Downs Boulevard, thus linking the northern and southern sections of Interstate 75 and completing the Tampa Bay Bypass. 1986 – Interstate 75 opened from Florida 826 (Palmetto Expressway) in Hialeah north to U.S. 27 at Andytown. A connection to Future Interstate 595 began construction. 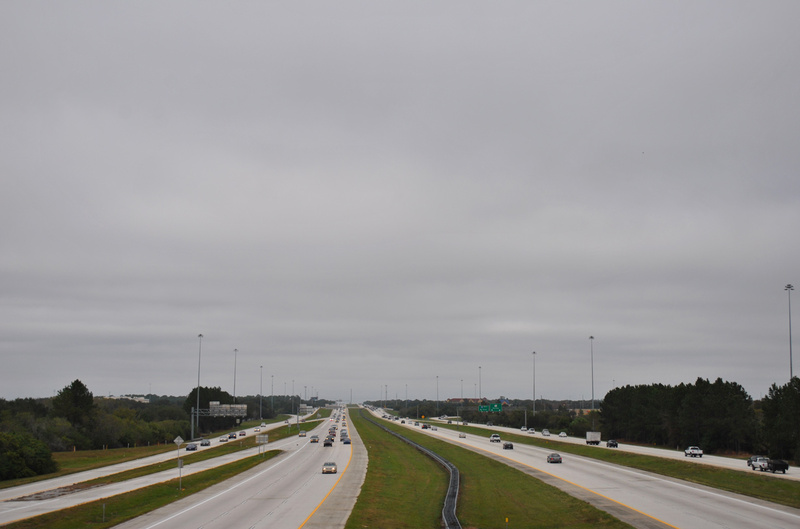 The only remaining unfinished part of Interstate 75 was the Alligator Alley corridor. 1989 – Construction begins to upgrade the Alligator Alley from a two-lane highway to a four-lane freeway. 1990 – The improved Interstate 75 (Alligator Alley) opened from Andytown west to Big Cypress. 1992 – Interstate 75 (Alligator Alley) opened from Big Cypress west to Florida 29. 1993 – Interstate 75 (Alligator Alley) opened from Florida 29 to Florida 951 near Golden Gate. 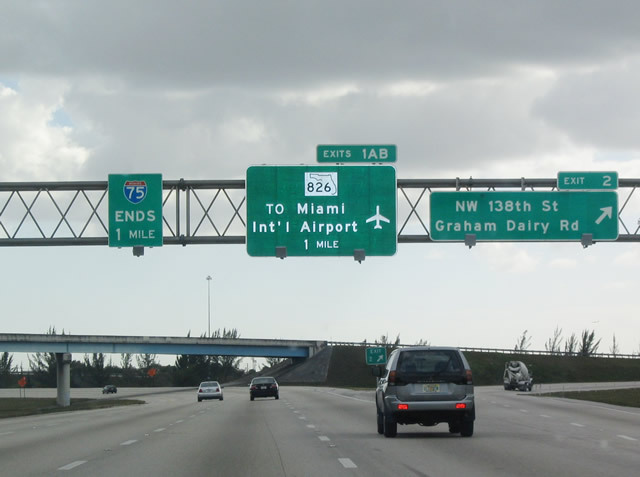 Interstate 75 is now complete from Florida 826 (Palmetto Expressway) in Hialeah north to the Georgia-Florida State Line, which includes both its original, planned route and the 1971 southerly extension to the Miami metropolitan area. In southern Georgia, Interstate 75 had several business loops that served cities such as Valdosta, Tifton, and Cordele. These business connections lead to U.S. 41 through these towns. At Macon, Interstate 75 meets Interstate 16, which connects Savannah to Atlanta. The Interstate 475 bypass is worthwhile for saving a few miles between Florida and Atlanta. All of Interstate 75 between the Florida state line and Macon carries six overall lanes. The stretch between Exit 18 (Georgia 133) and the Crisp/Dooly County Line near Milepost 106 was expanded as part of a $776-million project constructed between 1996 and April 8, 2011.2 Work added lanes on the inside of the freeway right of way with a concrete barrier median separating traffic. Many overpasses were also raised to current Interstate standards. Further north at the city of Macon, Interstate 75 again faces construction. Beginning at Hardeman Avenue and concluding at Pierce Avenue, the north-south route will see reconstruction and widening. This includes improvements to the western terminus interchange of Interstate 16 at Exit 165. Planning to improve the deficiencies at this interchange have been underway since the early 1980s. These processes initially culminated with the agreement of the preferred alternative at a Public Information Meeting held on October 24, 2000. 3.3 miles of the freeway was expanded leading northwest from Macon by November 2013,3 but continued delays pushed back road work at I-16 to fall 2016. See the Georgia I16/I75 Project web site for more details. 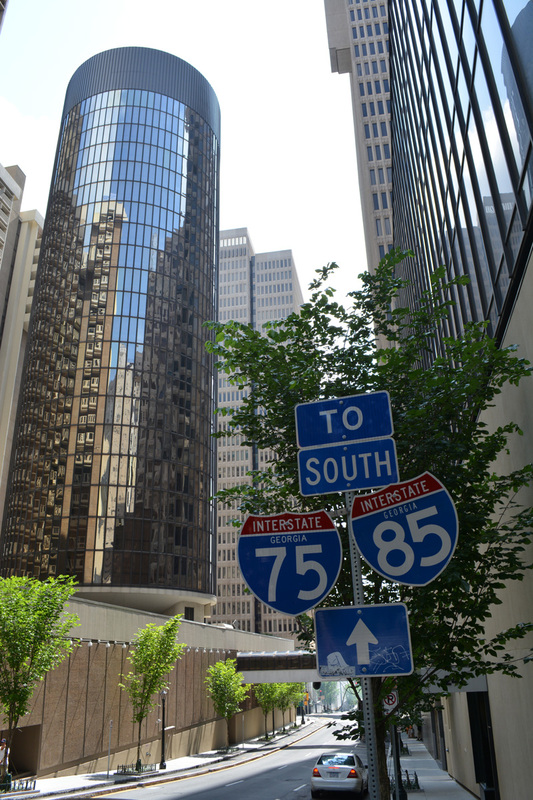 Continuing northward, Interstate 75 maintains six lanes to the metro Atlanta area, where the freeway swells with 16 overall lanes along side I-85 on the Downtown Connector. Traffic and capacity issues plague the Atlanta metropolitan area routine and improvement projects are always ongoing or in development. One such plan was the “Freeing the Freeways” mega project. Split in a series of projects strung out between 1976 and 1994, work along I-75 rebuilt the freeway from the Downtown Connector northwest to the Perimeter Highway (Interstate 285) from 1982 to 1987. Redesign of the Downtown Connector, including an overhaul of the junction with Interstate 20, followed between 1985 and 1988. 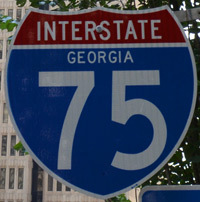 The arrival of the Summer Olympic Games in 1996 in Atlanta was preceded by the restriping of Interstate 75 to accommodate HOV lanes between May 1995 and May 1996. The HOV aspect of I-75 and other Atlanta area freeways restricted travel in the left-hand lane to HOV-2 eligible motorists. Lanes were enforced 24 hours a day. Some HOV lanes in the Atlanta were converted to HOT Lanes and more conversions are planned in the future. The success of the I-85 Express Lanes from Atlanta northeast to I-985 spearheads the drive to convert more lane miles into managed lanes along Interstate 75, more of I-85 and possibly I-285. As such, work between October 2014 and December 2016 adds two reversible HOT lanes (I-75 Express Lanes) to Interstate 75 from Georgia 155 (McDonough Road) north to Georgia 138 (Stockbridge Highway). The Northwest Corridor project will add Express Lanes between Akers Mill Road to Hickory Grove Road in addition to HOT lanes along I-575. Totaling 29.7 miles of managed lanes, construction may be complete by 2018. As a numbering side note, Atlanta is one of a small number of cities that carry two I-x5 interstate highways within its borders. Other examples of this include Interstate 35E and Interstate 45 in Dallas and Interstate 5 and Interstate 15 in San Diego. 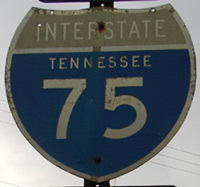 Once at Chattanooga, Interstate 75 changes direction from northwest to northeast. U.S. 41 departs toward Nashville and Chicago, while I-75 picks up U.S. 11. Here, I-75 provides the connection between Interstate 59 and Interstate 81, both of which parallel the U.S. 11 corridor. Interstate 75 meets Interstate 40 near Eaton Crossroad, and they merge for their journey toward Knoxville with up to eight overall lanes. Within Knoxville, Interstate 75 ran through Downtown along I-40 to Interstate 275 north from 1958 to 1982. The route shifted to the Knoxville bypass (I-640) when it was completed to alleviate Interstate 40 by Downtown. Some of the most beautiful mountain scenery along Interstate 75 can be found north of Knoxville en route to Kentucky at Jellico. This stretch of freeway parallels U.S. 25W. A feasibility study proposed in 2002 and dubbed the “Interstate 175 Corridor,” focused on a parallel corridor to Interstate 75 in Kentucky and Tennessee between Chattanooga and Lexington. The unfunded concept paralleled Interstate 75 to the west, perhaps along the U.S. 27 or 127 corridors. It never gained traction. Although Interstate 75 closely parallels U.S. 25 from Knoxville to Cincinnati, it does not take long for the route to be completely absorbed by the Interstate. U.S. 25 comes to its end at the Ohio state line as it crosses the Ohio River with U.S. 42 and U.S. 127. All of former U.S. 25 has been transferred to local control or made into a secondary state route from Cincinnati north to Detroit, excepting Ohio 25 between Bowling Green and Toledo and U.S. 24 between Toledo and Detroit. 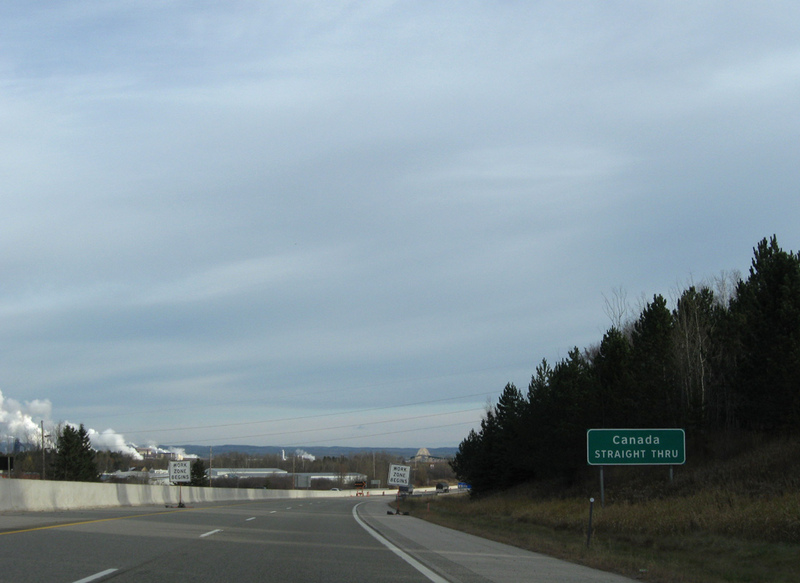 The decommissioning of U.S. 25 by 1974 is a philosophical difference: Some states prefer to keep the parallel U.S. highway designated, while others prefer to eliminate them as the Interstates were constructed. Good examples of this are former U.S. 25 and former U.S. 21 in Ohio. Construct new Interstate 75 bridge to the west of the existing Brent Spence Bridge and leave Interstate 71 on the Brent Spence Bridge. With this option, Interstate 71 and Interstate 75 would not be merged for any distance in Ohio, and the Brent Spence Bridge (Interstate 71) would be restriped for three lanes in each direction with full emergency shoulders. Construct two new bridges, one for Interstate 75 (to the west of the existing bridge) and one for Interstate 71 in place of the existing Brent Spence Bridge if it is determined that the existing Brent Spence Bridge cannot be reconstructed/rehabilitated to modern Interstate safety standards. Build new Interstate 75 bridge to west of Brent Spence Bridge and create an interchange with connections from the new bridge to both Interstate 75 and Interstate 71 in Ohio. The Brent Spence Bridge would remain in place, carrying Interstate 71 and local traffic only. Construct a new Interstate 71-75 bridge with ten lanes in place of the Brent Spence Bridge, which would be demolished. Remove Brent Spence Bridge and replace it with two bridges side-by-side, one for through Interstate 75 traffic and the other for through Interstate 71 and local traffic. Construct a new bridge for both Interstate 71-75 to the west of the existing Brent Spence Bridge, and retooling the Brent Spence Bridge for local traffic only. The new bridge would be built west of the existing Brent Spence Bridge in order to avoid an electrical substation and historic Longworth Hall. These alternatives, released as part of a $2 million study, would take over a decade to construct once funding is made available. The Kentucky Transportation Cabinet hoped to refine its list of alternatives to two choices in 2005. Since Kentucky owns the bridge, it was thought the state would bear most of cost.7 More recent news on the bridge indicates that tolling may be necessary to secure funding and shorten the time table needed to replace the span. Details and the potential time line on the project found at the Brent Spence Bridge Corridor web site. 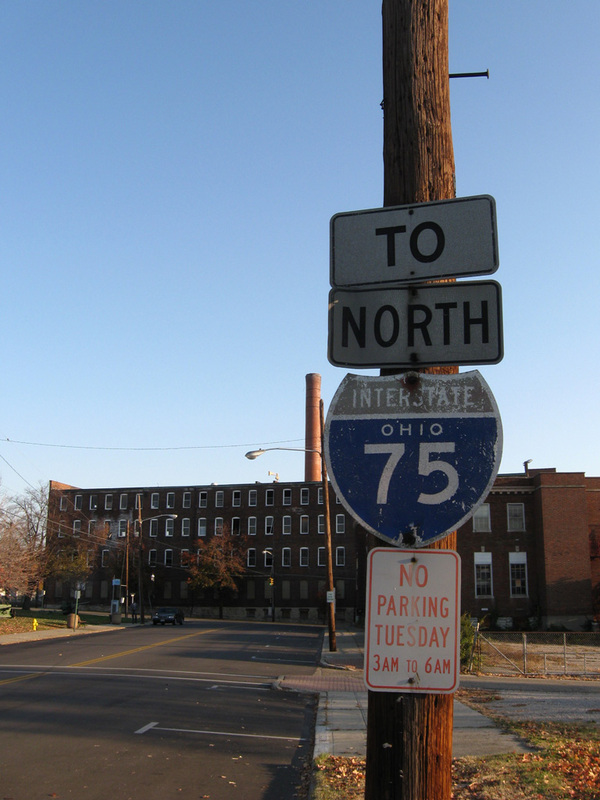 North from Cincinnati, an Ohio Department of Transportation project known as the “Thru the Valley Project” or North-South Transportation Initiative, focused on growing congestion along Interstate 75 from Ohio 561 north through Warren County. 2003 estimates were $1.56 million for the project, which included an option for new light rail, with $1 billion allocated to the stretch through Hamilton County.1,4 Preliminary studies and design work commenced in May 2004 to widen and reconstruct the freeway between Paddock Road and Interstate 275. 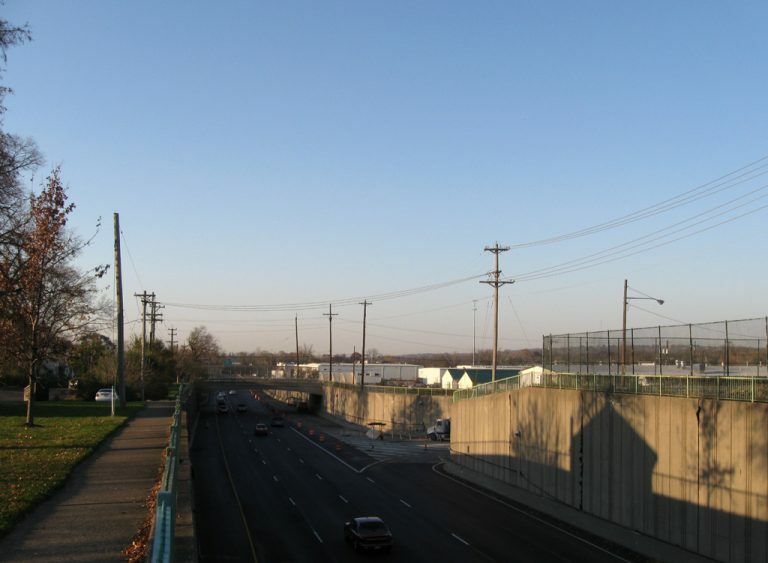 The roadways of Interstate 75 separate by up to a half mile through Lockland, Ohio. Southbound travels below grade at Exit 12 between Wyoming Avenue and Lock Streets. This view looks from the Wyoming Avenue overpass at the Cooper Avenue off-ramp. Photo taken November 8, 2009. Due to cost increases and rising inflation, work on the Thru the Valley Project was split into eight phases in 2009. Phases 1 through 3, included portions of I-75 between Shepherd Lane (Exit 13) and Glendale-Milford Road (Exit 14) and I-75 at Ohio 126 (Ronald Reagan Highway), were underway with property acquisition by 2016. Property acquisition for Phase 8 started in summer 2016 and will start for Phases 4, 5 and 6 in 2017. When completed, Interstate 75 expansion will bring the freeway to eight overall lanes, with added auxiliary lanes where needed. Phase 3 – reconstruct the freeway between the Mill Creek bridge and the trumpet interchange with Ohio 126 (Ronald Reagan Highway) and add a fourth lane in each direction. Costing between $39-49 million, with work scheduled between spring 2020 and fall 2021. Phase 4 – replace the railroad bridge over I-75 southbound and realign Exit 10 to Galbraith Road. Costing between $22-32 million, work starts in spring 2020 and runs through fall 2021. Phase 6 – add a fourth lane to Interstate 75 northbound while reconstructing the roadway from Galbraith Road to Shepherd Lane (Exit 13). Add a new ramp from Ohio 126 west to I-75 north. Construction on the $90-100 million project to commence in spring 2022 and be completed in the fall 2024 time frame. Phase 5 – rebuild the southbound lanes of I-75 from Shepherd Lane to Galbraith Road (Exit 10), adding a new lane and constructing a collector distributor road for new ramps with parallel Anthony Wayne Avenue and Galbraith Road. Costing between $63-73 million, work starts in spring 2020 and runs through the fall 2021 time frame. Phases 1 & 2 – expanded I-75 to eight overall lanes during reconstruction from Shepherd Lane (Exit 13) north to Glendale-Milford Road (Exit 14). Reconstruct the interchange with Shepherd Lane and realign Neumann Way to the east of Interstate75. The $87-97 million project breaks ground in summer 2017 and runs to spring 2020. Phase 8 – adding capacity to the diamond interchange (Exit 15) with Sharon Road and Chester Roads, work also adds a fourth lane to I-75 in each direction while reconstructing the mainline from Glendale Milford Road north to Kemper Road (just south of I-275). Construction on the $35-45 million phase is projected for spring 2020 to fall 2021. Construction funding was not allocated for any of the phases beyond 1 & 2 as of June 2016. So time tables are subject to change. 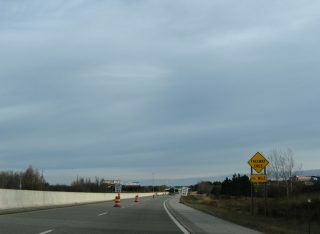 Phase 1A included reconstruction of the interchange between I-75 and Ohio 4 to eliminated a sharp curve, rebuilding ramps or closing ramps and replacing left-hand exits with right-side ones. Work included upgrading the Main Street exit and expanding the freeway mainline to six continuous lanes. The $122 million project ran through fall of 2011. Phase 1B commenced in March 2010. It expanded I-75 to six overall lanes between Edwin C. Moses Boulevard (Exit 51) and the viaduct over 5th Street (Ohio 4) and rebuilt a portion of the four-level interchange with U.S. 35. The $58 million element of the project was completed in fall 2013. Leaving the Buckeye State, Interstate 75 approaches the Detroit metropolitan area. Construction completed in July 2009 reconstructed the interchange with Interstate 96 as part of the Ambassador Bridge Gateway Project. The work improved the connection between Interstate 75 and the Ambassador Bridge linking Detroit and Windsor, Ontario. 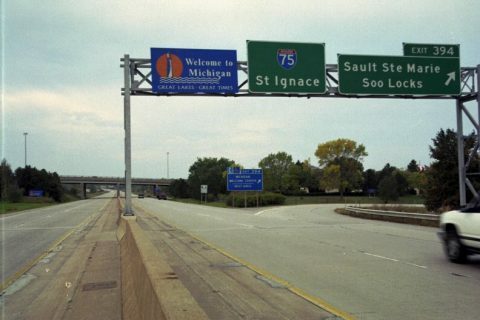 Interstate 96 eastbound was extended beyond its current terminus at I-75 to the bridge into Canada, while the westbound connection remains incomplete due to a jurisdictional dispute between the Detroit Bridge Company and MDOT. This project began on February 25, 2008. Interstate 75 leaves Downtown Detroit with a northerly trek toward the Upper Peninsula via one of the country’s longest suspension bridges, the Mackinac Bridge. 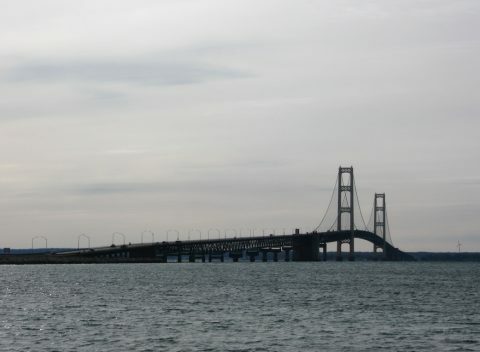 The Mackinac Bridge is symbolic for connecting the Lower and Upper Peninsulas of Michigan. Spanning the Straits of Mackinac, this toll bridge crosses over waters that freeze in the coldest winters. The left lane of the bridge is steel grating rather than concrete. Mackinac Island, home of famous Mackinac Island fudge, can be reached by ferry from either Mackinaw City or St. Ignace. 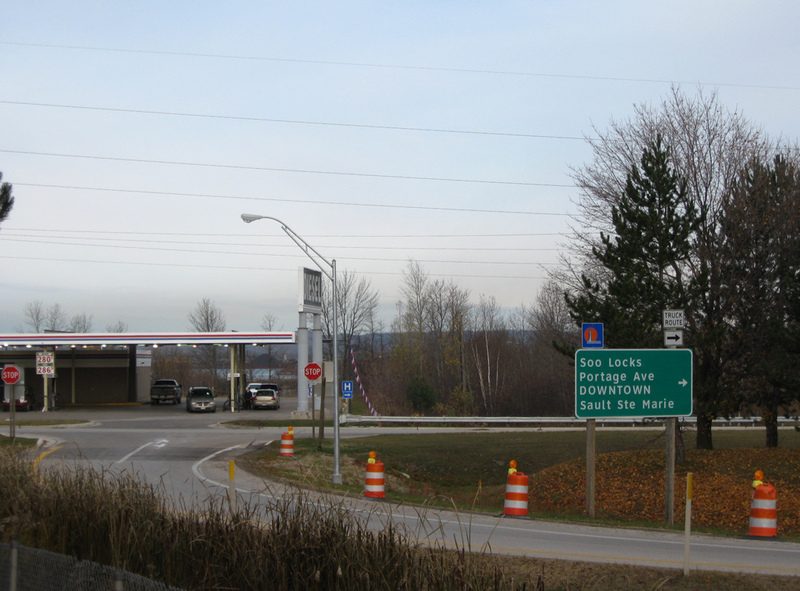 The northern terminus of Interstate 75 is at the Port of Entry in Sault Ste. Marie, Michigan. Beyond the Easterway Avenue interchange (Exit 394), the freeway narrows to two lanes to cross the International Bridge. The tolled arched truss bridge opened to traffic on October 31, 1962, linking Sault St. Marie Michigan with Sault St. Marie, Ontario. A two-year long International Bridge Toll Plaza project replaced conventional toll booths with a new enhanced toll collection system. The $8.9-million project commenced in May 2014. An end sign for Interstate 75 appears one mile out at Exit 2 to NW 138th Street. 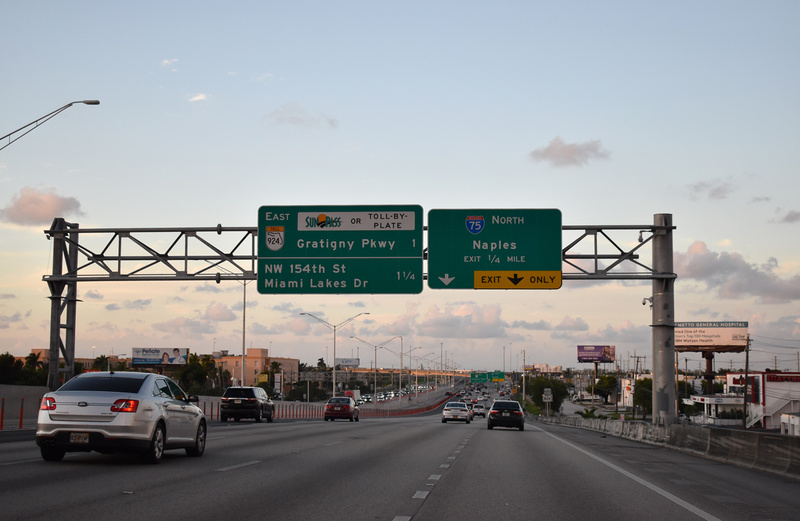 I-75 concludes its southerly course on the outskirts of Miami, within the city of Hialeah at an interchange with SR 826 (Palmetto Expressway) and SR 924 (Gratigny Parkway). 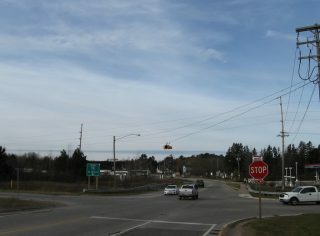 It does not connect to another Interstate or U.S. route at its southern terminus, but both state roads that originate from this interchange are limited access. Photo taken 03/04/14. Passing under NW 87th Avenue, Interstate 75 makes its final approach to Exits 1A/B with SR 826 (Palmetto Expressway). The freeway mainline defaults onto SR 924 (Gratigny Parkway) east to Opa-Locka. SR 826 leads southward to Miami International Airport (MIA) and the Don Shula Expressway (SR 874) south toward Homestead. Photo taken 03/04/14. 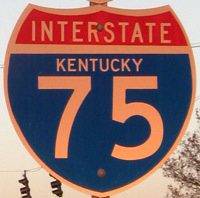 The final reassurance marker for Interstate 75 south. Photo taken 03/04/14. 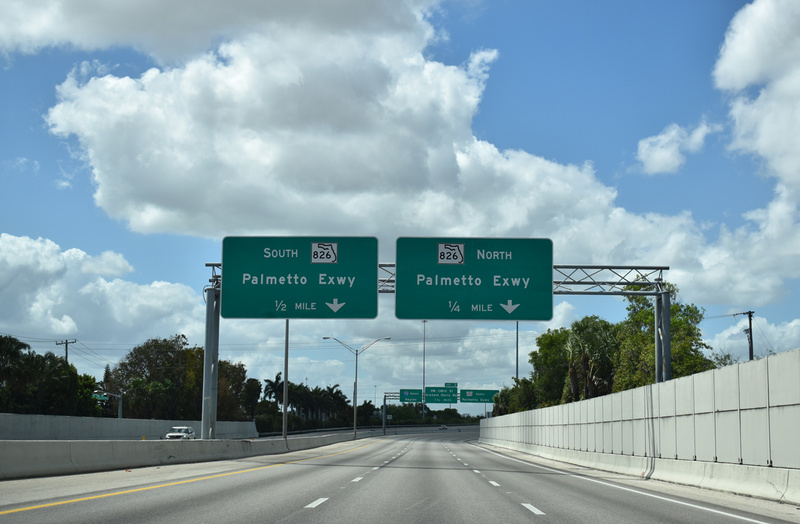 Exit 1B leaves the ending Interstate 75 with two lanes for the Palmetto Expressway south toward Miami. The mainline transitions to Gratigny Parkway, a tolled expressway leading east to NW 32nd Avenue in Opa-Locka. Photo taken 03/04/14. 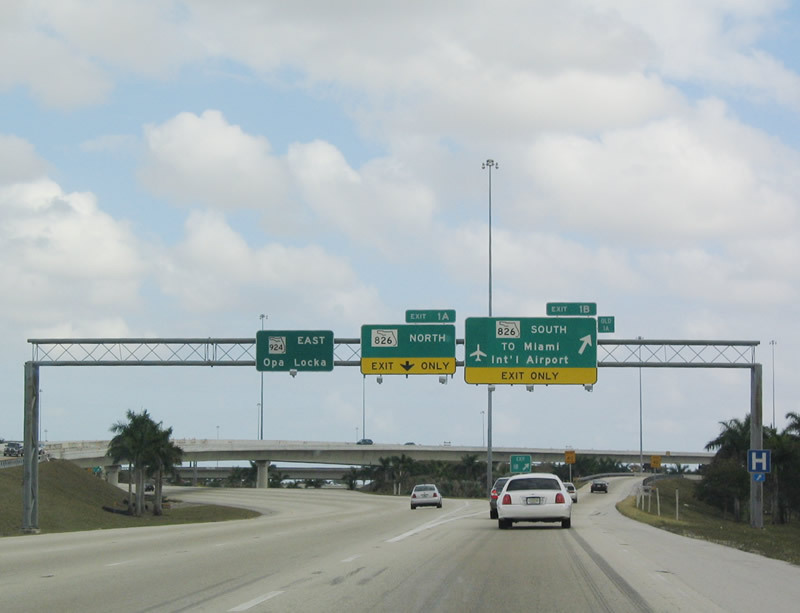 Exit 1A follows as a directional ramp to SR 826 north to the Golden Glades Interchange with I-95, U.S. 441 and Florida’s Turnpike. Photo taken 03/04/14. 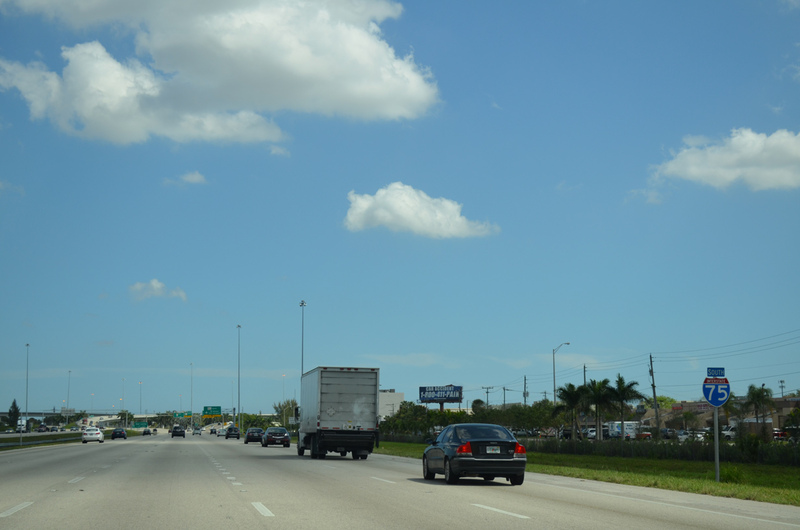 This mileage sign on northbound SR 826 (Palmetto Expressway) doubles as the one-mile sign for Interstate 75 north. The forthcoming directional interchange links SR 826 with the tolled Gratigny Parkway (SR 924) east as well. Photo taken 03/26/06. Florida 826 (Palmetto Expressway) north reaches the off-ramp for Florida 916 (NW 122nd Street and BW 138th Street). 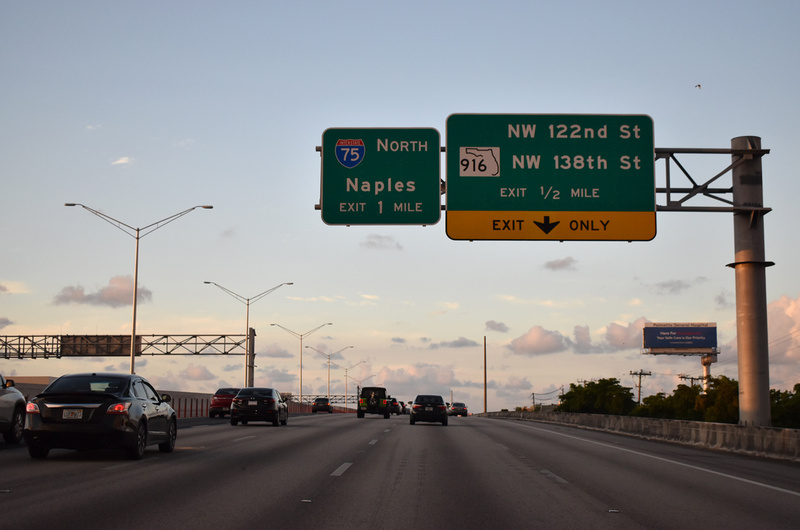 Interstate 75 begins its westerly trek to Naples and Southwest Florida in 0.75 miles. Photo taken 03/26/06. Beyond the exchange with SR 916, the right two lanes of SR 826 north connect to Interstate 75. This interchange was widened to accommodate more traffic in 2003-2004. Photo taken 03/26/06. 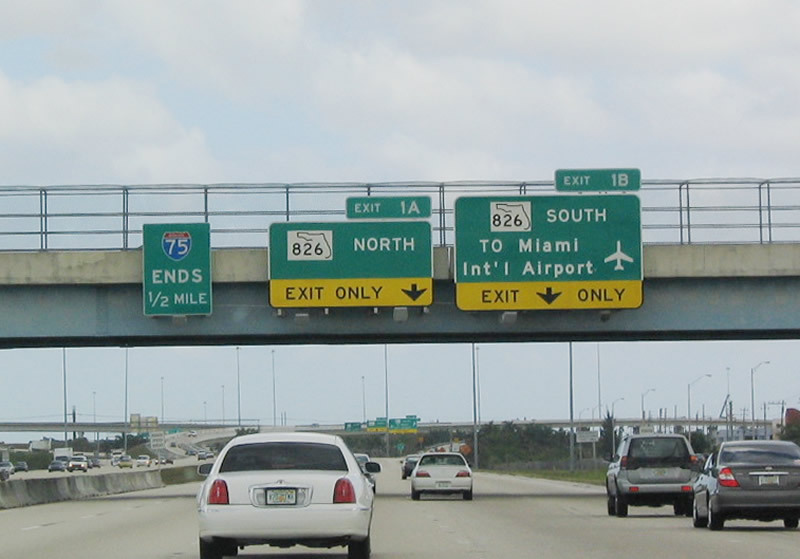 A two-lane flyover links SR 826 (Palmetto Expressway) north with Interstate 75 north. And so begins the second longest north-south Interstate highway. Photo taken 03/26/06. Signs along SR 924 (Gratigny Parkway) west acknowledge the transition to Interstate 75 north after the SR 824 (NW 57th Avenue) interchange. A toll collection point precedes the ramps to SR 826 (Palmetto Expressway). Photo taken 04/01/14. 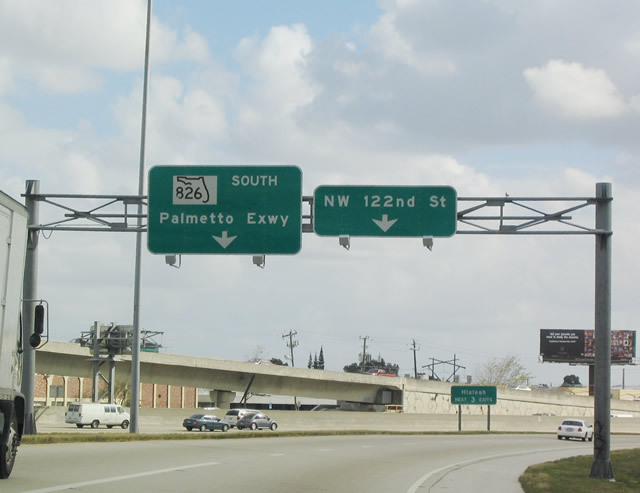 Ramps for the Palmetto Expressway from the ending Gratigny Parkway use exit numbers for I-75 as SR 924 ends and the Interstate begins. Photo taken 04/01/14. The first reassurance marker for Interstate 75 appears after the on-ramp from SR 826 south onto the ending SR 924, but before the flyover from SR 826 north. Photo taken 04/01/14. December 28, 2003 photos taken along Interstate 75 south leading to Florida 826 (Palmetto Expressway). Exit 394 is the final departure point before the International Bridge toll plaza and crossing to Sault Ste. Marie, Ontario. Photo taken 11/06/09. Interstate 75 reduces from a four-lane freeway to the two-lane International Bridge beyond Exit 394 for Easterday Avenue. Photo taken 11/06/09. Exit 394 departs I-75 north for Easterday Avenue. Easterday Avenue leads motorists to the Soo Locks, Portage Avenue and Downtown Sault Ste. Marie. Photo taken 11/06/09. Looking north from the Easterday Avenue overpass at the ending Interstate 75. 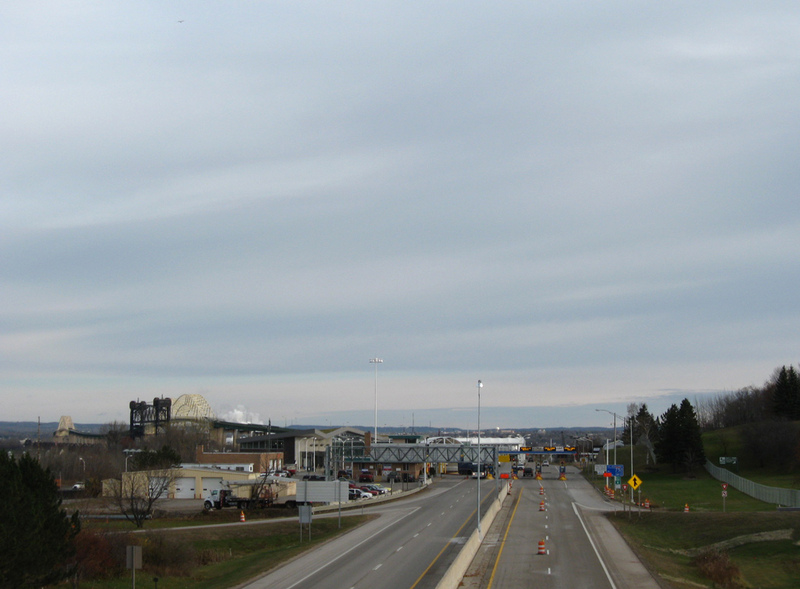 The tolled International Bridge comes into view along the horizon. The 2.8-mile long span provides a vertical clearance of 124 feet. Photo taken 11/06/09. 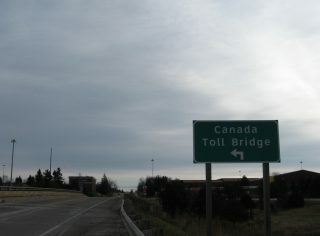 An end shield was posted ahead of the International Bridge toll plaza. Tolls booths pictured here were removed during a two-year project to modernization toll collection operations for the truss arch bridge. 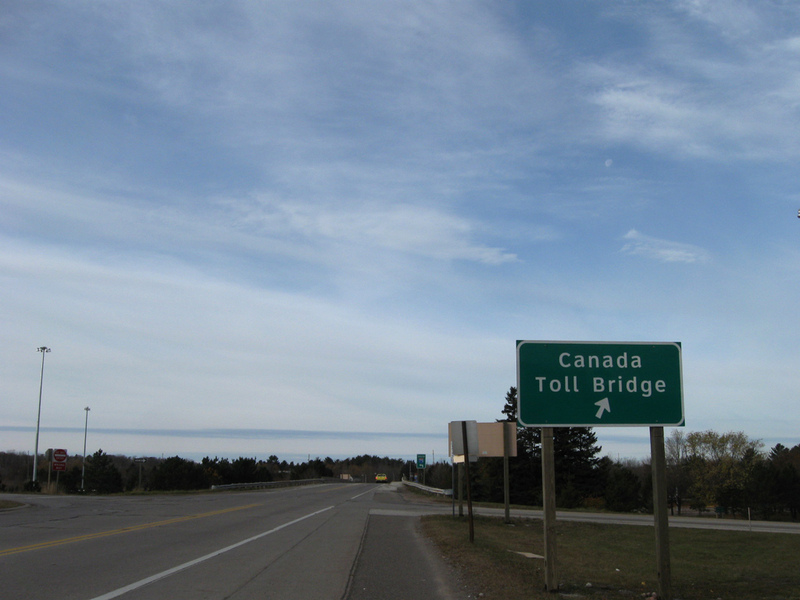 Upon reaching Canada, the main routes in Sault Ste. Marie are the Trans Canada Highway and Kings Highway 17. Photo taken by Jeff Royston (10/00). After departing the customs booths, Interstate 75 sees its first southbound interchange at Exit 394 with Easterday Avenue at Sault Ste. Marie, Michigan. 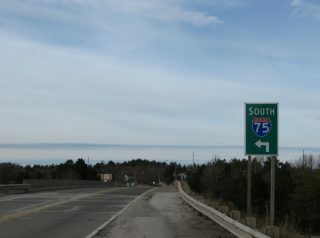 The first control city for I-75 south is Saint Ignace, an Upper Peninsula community where the freeway crosses the tolled Mackinac Bridge and U.S. 2 ends from the west. Photo taken by Jeff Royston (10/00). Taking Exit 394, motorists reach Portage Avenue. Portage Avenue leads north from Easterday Avenue to Soo Locks and Downtown Sault Ste. Marie. A tourist information center is located to the left between the off-ramp and Easterday Avenue. Photo taken 11/06/09. Spanning I-75, Easterday Avenue nears the northbound ramp for the ending I-75 at the International Bridge toll plaza. Signs simply reference Canada. Photo taken 11/06/09. 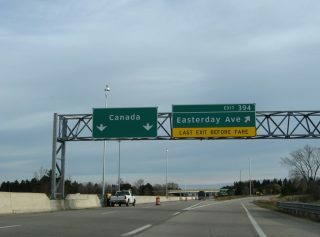 Easterday Avenue west at the northbound on-ramp to the International Bridge for Sault Ste. Marie, Ontario. No signs acknowledge the on-ramp as I-75. Photo taken 11/06/09. Crossing over the freeway, Easterday Avenue west approaches the southbound on-ramp for Interstate 75. Photo taken 11/06/09. 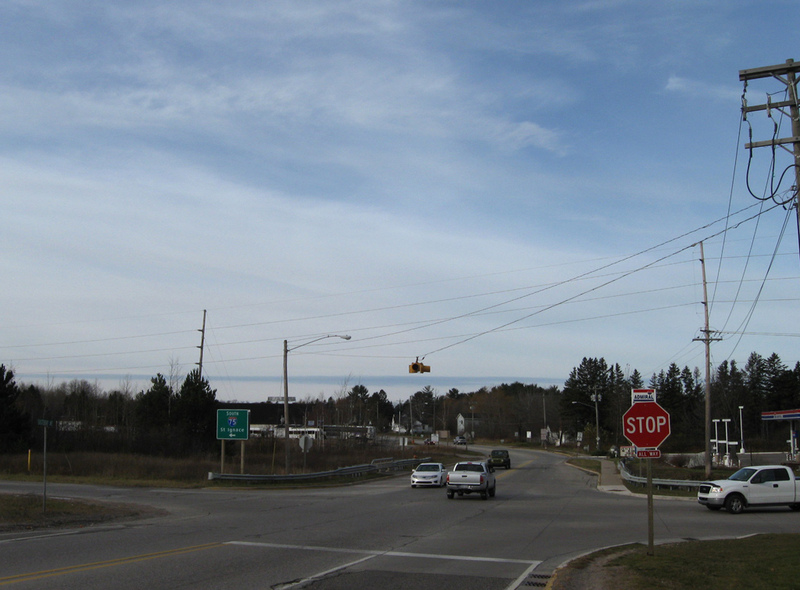 Portage Avenue intersects Easterday Avenue opposite the southbound ramp to Interstate 75 for St. Ignace. Photo taken 11/06/09. “Price tag for I-75 at $1.6B.” The Cincinnati Enquirer, September 9, 2003. “Widening of I-75 now complete.” Tifton Gazette, April 8, 2011. “Interstate widening project wraps up in Macon.” Macon Telegraph, November 4, 2013. “I-75 plan with rail passes.” The Cincinnati Enquirer, October 10, 2003. “Taft plan would widen I-75, I-475.” The Toledo Blade, August 7, 2003. “Plans show options for Brent Spence: All six have pros and cons, all costly.” The Cincinnati Enquirer, January 30, 2004. “Done At Last 75 – Drivers back in fast lane after 5 years – First in a series.” The Kentucky post (Covington, KY), August 20, 1994. “Decade-long I-75 modernization ends early, nearly $1M under budget.” WHIO, September 22, 2016. Thru the Valley – I-75 Widening and Reconstruction – Fastlane Application Information. page accessed on September 26, 2016.